The Islamic Jihad terror group, which was responsible for firing a barrage of rockets at southern Israel last Wednesday, is toning down its rhetoric. 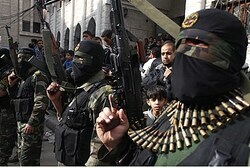 The head of the group, Ramadan Shallah, said on Saturday night that while Islamic Jihad was not interested in an escalation, it would fight Israel according to the circumstances on the ground. “If and when a war is forced upon us, we will fight, even though we are aware of our ability and our modest weapons. But we are able to deter, to stand firm and to hurt the enemy,” said Shallah in a television interview. He further noted that his organization, along with Hamas, signed the ceasefire which brought an end to the IDF’s Operation Pillar of Defense in late 2012 and is still committed to it. He stressed the importance of coordination between the various Palestinian Arab organizations in response to any Israeli “aggression”. Shallah dismissed claims that Iran was instructing the Islamic Jihad on when to fire rockets at Israel. “Every time the Israelis kill Palestinians and we try to respond, there are those who say that it is due to regional reasons. Our rifle is not for rent; it is Islamic, Palestinian and independent,” he claimed. The comments are far different than the ones made just last Wednesday by the Islamic Jihad. Hours after it fired more than 60 rockets as Israel, the group threatened to up the ante and fire long-range rockets at Israel if the IDF strikes in Gaza. Netanyahu: I want Trump to help us reach a two-state solution Prime Minister says Trump a friend of the Jewish people, expresses hope he will nix Iran deal – and pave the way for a Palestinian state. Is Netanyahu out of his mind?